Apparently it’s Bacon Day here at Nummy Num Num, and as days go, that’s not too shabby. The Chef likes to serve this with steak, and I’d like to suggest the Coffee Rubbed variety for your noshing pleasure. Cook bacon in a large skillet until crisp. Transfer bacon to paper towels to drain. Whisk honey, vinegar, and mayo in a large bowl. Stir in slaw mix, cheese, and bacon. Season with salt and pepper and toss to coat. Cover and chill for up to 2 hours until ready to serve. 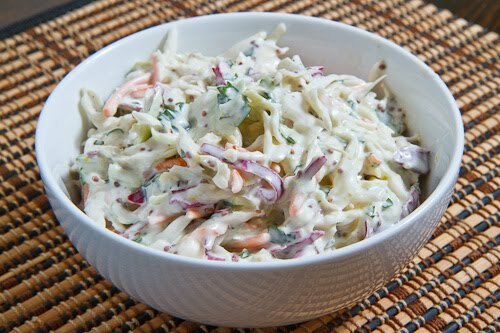 This reminds me of the slaw in the Dinosaur BBQ cookbook. My wife hates mayo, so anything that includes a smaller amount with other ingredients to thin it out is a winner in our book.